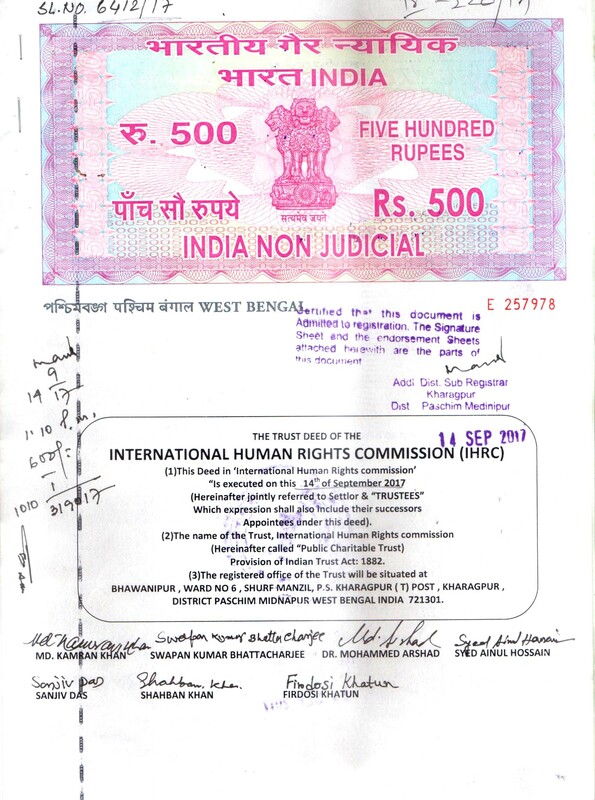 International Human Rights Commission-IHRC is a non-government, non-profitable International Human Rights Organization. 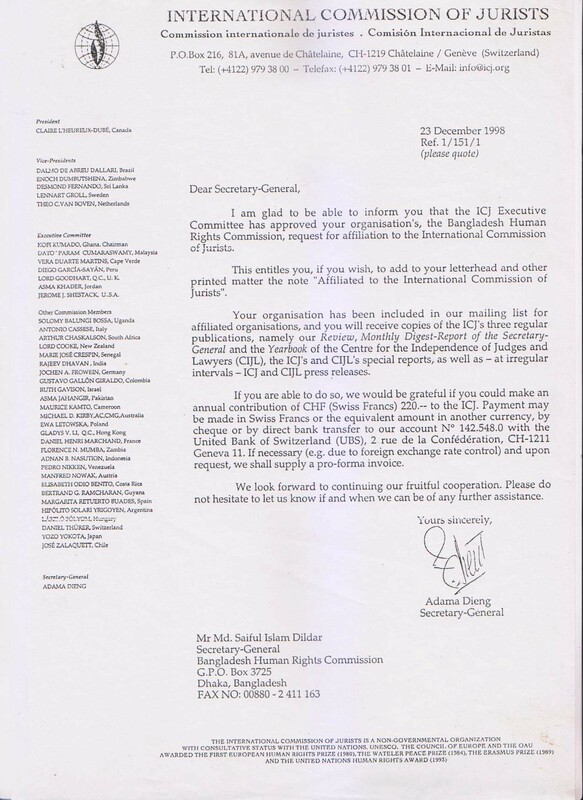 The name of the International Executive Committee (IEC) of IHRC was declared on 24th December 2003 in Geneva, Switzerland, the head quarters of UN. The IEC have been established with 24th Member from 24 countries of Asia, Africa, Europe and America. Each member country of United Nations will be member of IHRC. 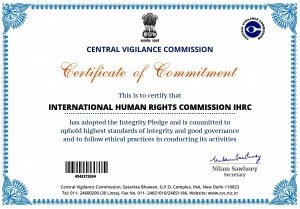 IHRC has been established for eradicating atomic weapons, conducting impartial inquiry of my torture in national or international level, mobilizing public opinion for peace and against war, materializing UN Charter of human rights in each and every country and to make UN a sovereign, neutral and rights organization. The IHRC will gradually take affiliation of UN and International Network bodies. 8. FUND, ACCOUNTS AND AUDIT. IHRC theorem: The main theorem of IHRC will be total eradication of the Nuclear weapon from the world. Attempt to create uniformity among rich and poor nations, effort to place UN as peak organization of world societies. Creating international awareness in national and international level against all kinds of tortures, conducting independent inquiry, establishing global public opinion against war while favouring peace, fulfilling universal franchise of human rights by each country, eradication of all kinds of arms and landmines from the world and to carry the message of human rights education to all. (A) Activities: The main activity of the member state is to materialize the theorems of above clause. 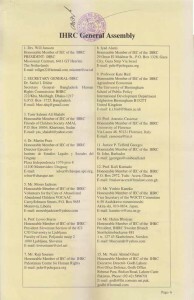 (B) Eradication of Atomic weapons: To make direct lobby with developed country and to create world wide public opinion through UN & International Organization for eradication of stocks of atomic weapons and its use from the word. (C) Inquiry against torture: IHRC will arrange neutral inquiry against all kinds of torture worldwide both in national and international level. These inquiries will be done by renowned personalities who are specialized in this line in national and international level. The appointed persons of the IHRC will submit their inquiry report to UN human rights commission, related countries & organizations, through IHRC. (D) Establishment of Justice: To make if sure that each and all of the world citizen get justice from the court of his own country & also world court. (E) Equity between rich and poor country: Exploitation the poor by rich countries will not go. The economic equilibrium of each country is essential. The sovereignty of mankind is the universal truth and this should be established irrespective of caste, creed or race. The economic freedom of every men & women must be ensured. For financial self dependent of each man there should be free flow of trade and commerce among all countries. (F) Human Rights Education: IHRC will introduce Education activities in national and international level for development of human rights education. This long & short program will be proper action for human rights. IHRC will confer honourary doctorate degree for different issues on Human Rights as a part of its long-term education program. (G) Arbitration: IHRC will take part in national and international activities of arbitration through which countless people will get back their right to establish. UN Nation: UN is the head of all nations and peak organization. It is possible to establish equity, justice, development and peace though neutral and powerful action of UN it is not just to keep difference among UN nations. To honour the UN means to obey all decisions of UN by each and all states of UN. This is the faith of IHRC. Each country must be bound to obey the human rights charter of UN. No big state will be allowed to attack a small state. The VETO power should also be abolished. The human rights commission of UN should be more strengthened. Constitution: (A) General Assembly, (B) Associate Member, (C) International Executive Committee, (D) National Assembly, (E) Ambassadors/Coordinators, F) IHRC Commissioner, (G) IHRC Secretariat. (A) General Assembly: A non-govt. person from member country of UN & obedient to IHRC charter will be a member of general assembly. The VIPs of national and international level will be given priority in the general assembly to be the member. General Assembly will be the highest council with one-three members from each country. This assembly will seat in 5 years time in any country of the world. (B) Associate Member: One representative from the Government of each member country will be associate member of this assembly. The associate members will join each assembly but will not be able to caste vote or participate in Executive Committee election. 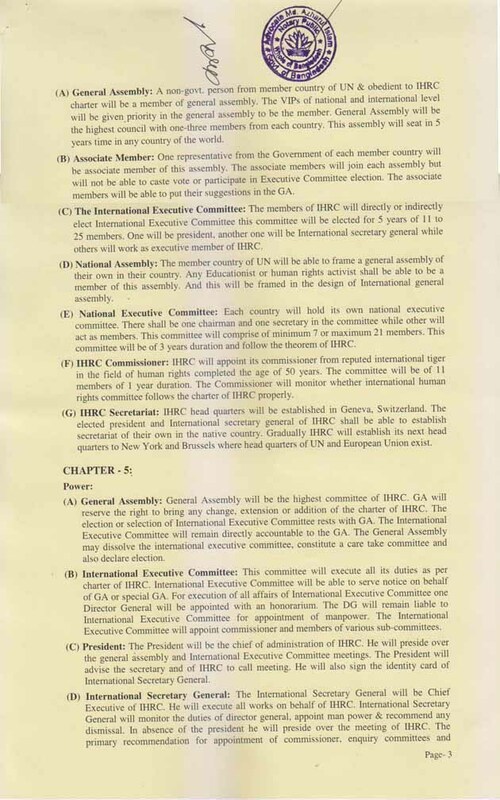 The associate members will be able to put their suggestions in the GA.
(C) The International Executive Committee: The members of IHRC will directly or indirectly elect International Executive Committee this committee will be elected for 5 years of 11 to 25 members. One will be president, another one will be International secretary general while others will work as executive member of IHRC. (D) National Assembly: The member country of UN will be able to frame a general assembly of their own in their country. Any Educationist or human rights activist shall be able to be a member of this assembly. And this will be framed in the design of International general assembly. 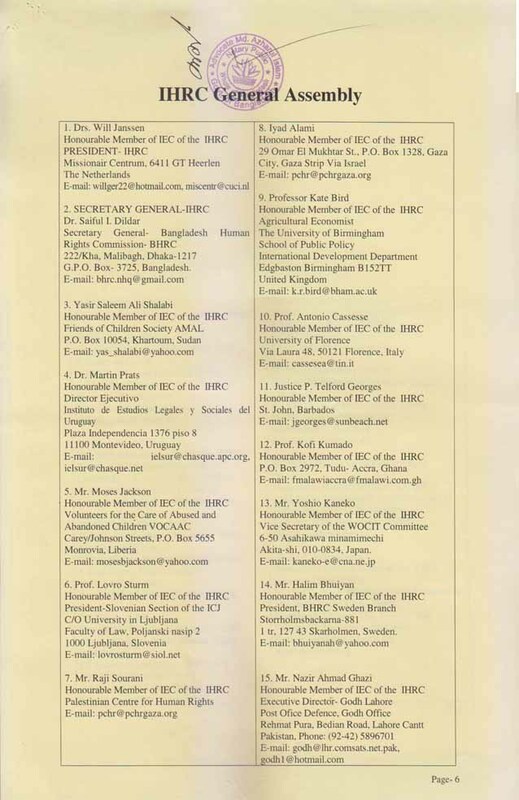 IHRC will appointed one or more Coordinators/Ambassadors in seven continents of the world like Asia, Europe, Africa, Australia, South America, North America and Antarctica also regarded as its geographical circumstances.Coordinators/Ambassadors of IHRC will make a national and regional committee in different region of their countries. They will also use monogram, nameplates and flag of IHRC. (F) National Executive Committee: Each country will hold its own national executive committee. There shall be one chairman and one secretary in the committee while other will act as members. This committee will comprise of minimum 7 or maximum 21 members. This committee will be of 3 years duration and follow the theorem of IHRC. 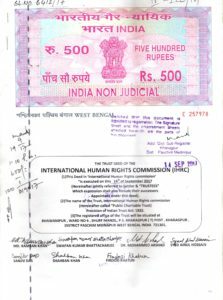 (G) IHRC Commissioner: IHRC will appoint its commissioner from reputed international tiger in the field of human rights completed the age of 50 years. The committee will be of 11 members of 1 year duration. The Commissioner will monitor whether international human rights committee follows the charter of IHRC properly. (H) IHRC Secretariat: IHRC head quarters will be established in Geneva, Switzerland. The elected president and International secretary general of IHRC shall be able to establish secretariat of their own in the native country. Gradually IHRC will establish its next head quarters to New York and Brussels where head quarters of UN and European Union exist. (A) General Assembly: General Assembly will be the highest committee of IHRC. GA will reserve the right to bring any change, extension or addition of the charter of IHRC. The election or selection of International Executive Committee rests with GA. The International Executive Committee will remain directly accountable to the GA. 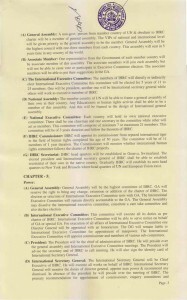 The General Assembly may dissolve the international executive committee, constitute a care take committee and also declare election. (B) International Executive Committee: This committee will execute all its duties as per charter of IHRC. International Executive Committee will be able to serve notice on behalf of GA or special GA. For execution of all affairs of International Executive Committee one Director General will be appointed with an honorarium. The DG will remain liable to International Executive Committee for appointment of manpower. The International Executive Committee will appoint commissioner and members of various sub-committees. (C) President: The President will be the chief of administration of IHRC. He will preside over the general assembly and International Executive Committee meetings. The President will advise the secretary and of IHRC to call meeting. He will also sign the identity card of International Secretary General. 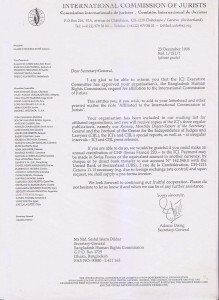 (D) International Secretary General: The International Secretary General will be Chief Executive of IHRC. He will execute all works on behalf of IHRC. International Secretary General will monitor the duties of director general, appoint man power & recommend any dismissal. In absence of the president he will preside over the meeting of IHRC. The primary recommendation for appointment of commissioner, enquiry committees and arbitration committee will be done by International Secretary General which will ultimately be accepted by executive committee. The International Secretary General will distribute duties of executive members of IHRC. (E) IHRC Commissioner: These Commission will act as respectable adviser. They will solve all internal problems. Besides they will monitor the execution of all IHRC charters and propose their ideas for welfare of IHRC. (F) National Assembly: The National Assembly of IHRC will be held once in a year. The secretary will issue 30 days notice for national assembly as per advice of the chairman. In the same member secretary will serve 15 days notice for any special national assembly. (G) National Executive Committee: Minimum 4 meetings of the executive committee will be held in a year. The secretary may call Executive Committee meeting on a notice of 10 days notice. Attendence of 50% member will be considered for Quorum. (H) Chairman: The national executive committee meetings and general assembly will be presided by the chairman. They will also advise the secretary for calling meetings. (I) Secretary: As like International Secretary General the secretary will do all works in his country. He will work for fund collection, execution of project, appointment and dismissal etc. (A) General Assembly: This assembly will take place once in two years in any country. With due discussion with the members the president or International Secretary General may call general assembly. The meetings will be called at 45 days notice. While special general assembly will be called at 30 days notice. Quorum will require 50% attendance. The attending members will be able to take major decision in the meeting. The international executive committee meeting will elect executive committee either in camera or openly. 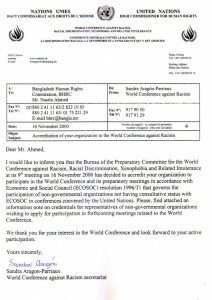 (B) International Executive Committee: The International Secretary General will call IHRC Committee Meeting at 24 days notice. One third presence of the members will be needed for quorum. No decision will be accepted without recommendation of 50% international member. At least 3 conference will have to be arranged for international executive committee. The written support of absentee member will be accepted. At least one meeting of commission will have to be held. (C) National Assembly: This assembly will take place once in a year. As per advice of the chairman the secretary will call the assembly at 30 days notice. Accordingly 15 days notice will be served for any special general assembly. (D) National Executive Committee: There will be at least 4 National Executive Committee meetings in a year. These meetings will be called at 10 days notice by the secretary as per advice of the chairman. The special emergency meeting may be called at 3 days notice. While quorum will require 50% presence. 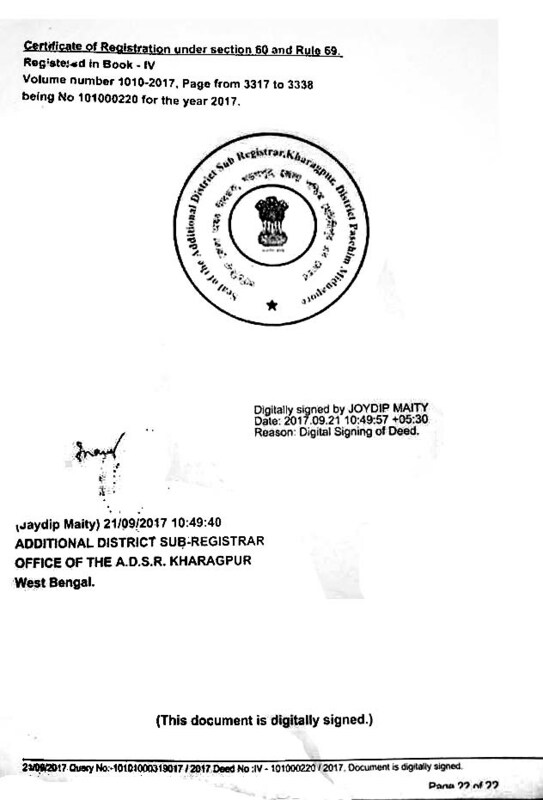 (A) Logo, (B) Flag, (C) Language, (D) Identity Card and (E) Signboard. (A) Monogram: IHRC will have a monogram to be used in all levels equally. There shall be rising of light lava from global map. 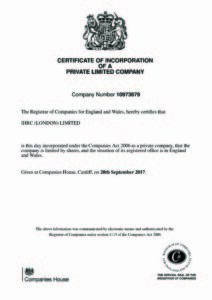 Monogram will be used in all sectors of IHRC & may be of one or multi colour. (B) Flag: IHRC will have a flag. White monogram will take place within deep blue horizon. The flag will be built in terms of national and international rules. The President, International Secretary General, Commissioners, Members of General Assembly, Chairperson of National Executive Committee and Secretaries will use the flag within their geographical area. (C) Language: Initially IHRC will use English as its official language. There after the language of majority people will be added as its office-language. While National Executive Committee will use its state language. (D) Identity Card: All members will have equal identity card with uniform monogram. Deep Sky blue horizon will hold white colour writing in the card. While International Executive Committee and Commissioner will hold red card with white colour writing. The card of International Secretary General will be signed by President & the International Secretary General will sign those of all members of GA, Chairman, National Executive Committee, Secretary & Director General. Secretaries will sign the I.D. Cards of Members of National Assembly and National Executive and other officials. (E) Signboard: IHRC will have sign boards in all its national and international offices. The white colour writing will take place in deep sky blue horizon of the board. (A) Fund, (B) Accounts & (C) Audit. (A) Fund: IHRC will create fund for running its activities. This fund will be created from govt. fund, donation from International Agencies, personal donation & Members subscription. National Executive Committee will collect fund in the same manner like IHRC. The members of general assembly and IHRC Commissioner will pay 100 US$, subscription per year. The members of national assembly will pay 50 US$ each per annum of which 40 US$ will be sent to the account of International Executive Committee. International and National Executive Committee will take decision in case of increasing or decreasing subscription. (B) Accounts: From International to National Executive Committees will maintain Bank Account with one or more than one Commercial Banks. The President, International Secretary General & Director General will jointly open Bank Account while this account will by operated by any two signature of above. The President, The International Secretary General and The Director General can open the Current Account or Savings Account in Commercial Bank in their own country individually signature. On the other hand the chairman & the Secretary will jointly operate the bank account in case of National Executive Committee. Any change in this respect may be brought by National or International Executive Committee. (C) Audit: Audit of the Accounts will be done by any audit company reputed nationally or internationally. Importance will be given in case of transparency in accounts which will be done by regular audit and inspection. 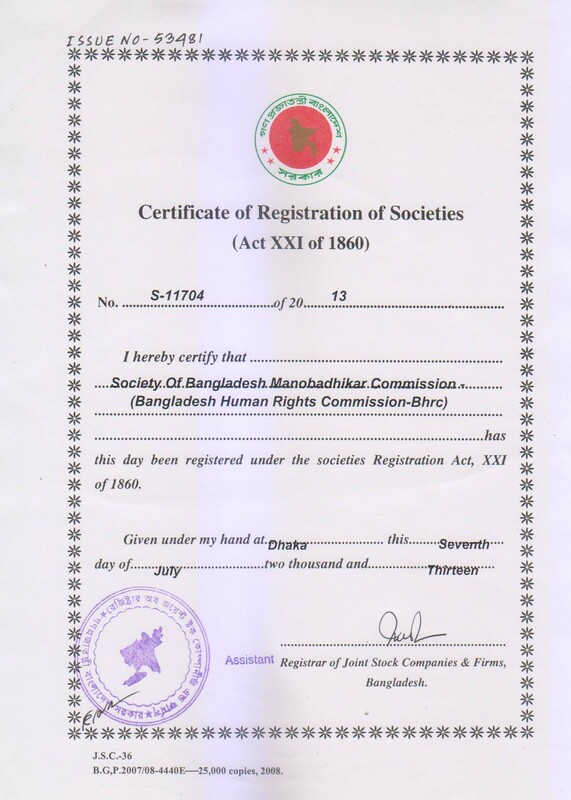 Bangladesh Human Rights Commission- BHRC is one of the largest Voluntary International human rights and peace bodies working against torture and for the preservation, promotion and upholding of human rights/peace with over 600 branches in home and abroad. 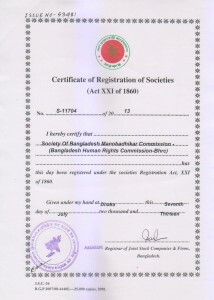 BHRC registered by the Government of Bangladesh under Prime Minister office (NGO Affairs Bureau) and Ministry of Social Welfare. BHRC established in 1987 as per charter of UN bill of rights. It is accredited/registered with United Nations and Affiliated Status with the International Commission of Jurists- ICJ. It has also member body of OMCT/SOS Torture Network (Geneva) and Member with Observer Status of African Commission on Human & Peoples Rights. 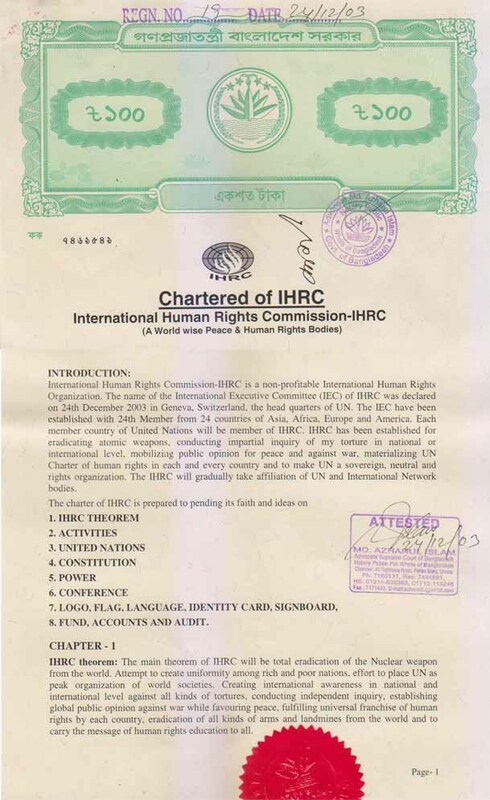 BHRC is affiliated with many other national and international bodies and Peoples Rights etc. This commission which believes in the non-violence has engaged it self for serving the humanity incessantly by the district branches of the commission in each district and process of constitution of other branches are continuing. Eminent persons of the country i.e. elite’s viz: educationalists, lawyers, journalists, physicians and other notable social workless have been included in the head office and branches of BHRC as members Besides, a good number of women representatives and representatives from the minority and tribal people have been included in each one of the branch committee of the Commission. Members of the branches of the commission are working against the injustice, illegality and oppressions of the and with the aim of establishing rule of law and human rights on a completely voluntary basis. For the purpose of the development and preservation of human rights in their respective fields and for giving free legal aids every branch of the commission has engaged itself incessantly in the works of the implementation of the manifold programmes including the works for the solution of the problems by arbitration, resistance of violation of human rights with the help of the administration preparation of impartial reports by the investigation of the incidences of violation of different human rights and sending of them to the relevant authorities, regular publication of the magazines on human rights, to make arrangements for the recovery of the rights of men and women who have been deprived of their rights by filing suits in the courts of law on behalf of the oppressed people, making arrangements for seminars, workshops and training for enhancing awareness about human rights, publication of booklets, leaflets, and poster on human rights. observation of all the elections, to start self-dependence programme and to help the distressed affected people during the periods of disasters National Headquarter and branch committees of the BHRC have been giving free legal consultations and aids to more than 40 thousand helpless people every year on an average. National Executive Committee: National Executive Committee of the BHRC shall operate all the programmes of the head office and supervise all the activities of the branch committees within the different areas of the country following the constitution of the BHRC/national guide line in the national level, this committee may receive any complain from any person, groups or nation on the matter of national, regional and international interests related to the violation of human rights. National executive committee shall be competent for carrying out investigations in the national and international level. It may take initiatives for the settlement of the problems by arbitration, it may take urgent action and take legal action through the courts including taking measures for creating pressures through administration against incidents of the violation of human rights. Programs of the Branches: Committees of the branches shall perform the duties for the development and preservation of the human rights as the local representatives on behalf of the National Executive committee within the geographical areas of each branches of BHRC. It shall carry on voluntary activities on any matter involving the violation of human rights i. e. prevention of tortures of women, prevention of trafficking of women and children, settlement of problems of families by arbitration, prevention of illegal tortures by the members of the law enforcing agencies and prevention of torture on the detainees in the prisons, prevention of illegal decrees on religions, tortures related to jobs and establishment of rights of the workers, preservation of the rights of the minorities and tribal people and giving helps and assistance’s to the distressed during the periods of disasters. When any incidence of any violation of any human rights comes to the notice of any branch in any area which is outside the boundary of the activities of such a branch. It shall inform the matter directly to the relevant district branch. Except that, branches shall try to inform the head office of the BHRC about the matter, District branch shall take initiatives for watching all kinds of elections with the assistance of the head office and branches affiliated under the commission. For taking legal action against any incident of any offence there is Government departments including police department and courts of law. Branches of the Human Rights Commission shall take steps when written application is received by it from the people who became victim of violation of human rights as a result of misuse of law or when it has been informed of such incidents by the media. With the aim of the development and preservation of human rights in their respective areas, branches shall make arrangements of meetings, workshops peace processions etc. Except that, it may make arrangements for the discussion meeting on human rights in the educational and industrial organizations. Branches of BHRC shall not make arrangement for any violent programme like aggrieved protest meeting, aggrieved processions, strike, blockade. Ways of non-violence shall be the process to be followed by the branches of the BHRC. Only the district, City Corporation and Supreme Court branches shall be eligible for filing suits directly in the courts. Other branches may file suits in the courts in the names of the respective branches after taking permissions from the district branches. After filing case in the court, all the branches shall inform the subject matter of the suit to the head office on an emergency basis. If the branches wish, they may publish notice or make arrangements for press conference on the violation of human rights for the purpose of their publicity. Coordination committees in the divisions shall watch the matters of violations of human rights and they may request to the relevant district committees for taking effective actions. If any branch or its member intends to file any criminal or civil suit against any other branch or member then in that case, written permission shall have to be taken from the head office of the BHRC. Affiliated Organization: National Headquarter of the BHRC may give permission to any organization as the affiliated organization who declares its allegiance to the national constitution of BHRC and national guideline. Affiliated organization shall remain bound for regularly submitting reports of their activities and accounts of their incomes and expenditure to the head office of the BHRC. Affiliated organizations may use the monogram of the BHRC. Affiliated organizations shall not use such a designation which creates any illusion due to any resemblance of it with any post of the national executive committee. National Standing Council: There is a national standing council or general council comprising of 17 members of the BHRC. BHRC was established and it has been running with the personal financial help from all long time sacrifices of the founder member. Besides, for the purpose of maintenance of the equilibrium, there is importance of the national executive Committee. National Executive Committee shall be constituted comprising of in total 11 members who shall be nominated as follows: 6 members from the members of founder standing council, 4 members are taken each from the greater Dhaka, Chittagong, Rajshahi and Khulna region or one each from old 4 divisions and 1 persons from among the eminent national level human rights workers. 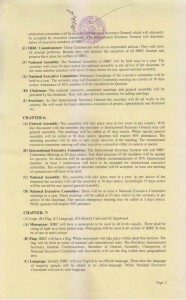 If any member of the National Standing Council dies, or if such a member becomes insance, in such cases any senior member of a branch having 10 years of experiences shall be included in lieu of him Meetings of National Standing Council or General Council may called by the Secretary General of the National Executive Council or by any letter signed by the two third members of the members of the National Standing Council. National Advisory Council: Eminent persons of the country including educationist, researches, lawyers, Journalists and retired Government servants who are aged 45 years or more shall be included in this council as National advisors National Executive Committee shall constitute National Advisory Council comprising of 7 to 11 members for a period of two years. Side by Side with National Executive committee, following the similar process, a National advisory council comprising of 9 members in the maximum may be constituted in all the branches of the BHRC. If the National Headquarter and the branch committees of the commission so desires. They may nominate any one as the national advisory chairman from among their respective National advisors. National Executive Committee: National Executive Committee of the BHRC shall operate all its activities during its tenure following the constitution/National Guideline and shall be responsible for all the activities. Number o member of the National Executive Committee shall comprise of 7 to 11 members. Total number of members shall be 11 which shall comprise of as follows: 6 members from the founder members, 4 members from 4 greater divisions and 1 nominated member for a period of five years. Before the inclusion of the members from the divisions. National Executive Committee shall be constituted with the members of the founder members. Total tenure of this committee shall be 5 years. Except one president, one Secretary General and one Treasurer everyday of this committee shall perform their duties as the members. National Executive Committee shall give approval directly to the National Advisory Council. Divisional Coordination Committee, District Branch, Metropolitan Branch, Supreme Court Branch. Head Office of the Commission shall give approval to the Upazilla/thana branch, Municipal Branch and University Branches sent with the recommendations from the district branches. For accelerating the activities of the commission. National Executive Committee may give approval or permanently or temporarily dismiss, cancel or retract the approval given to any branch committee Secretary General shall implement all the decisions on behalf of the National Executive Committee. National Executive Committee tenure will be for the period of five years. International Branch: BHRC shall take initiatives for constituting branches in almost all the countries of the world by phases. Works of constitution of branches in a good number of countries of the world in the European and American continents have been started by now. Initiatives shall be taken for including the citizens of the relevant countries who are of Bangladeshi hereditary origin on a priority basis in the committees of the BHRC. These committees which shall be directly affiliated under the National Executive Committee of the BHRC, shall enjoy the status of a full district branch and shall be constituted following the proforma of a district branch. Human Rights workers shall get the chances of travelling the countries of other human rights workers receiving training through the international branches. International Branch Committee tenure will be for the period of three years. Divisional Coordination Committee: There shall be 10 nos. Divisional Coordination Committees of BHRC in 10 divisions of the country viz. 1. Dhaka Metropolitan Division, 2. Dhaka South Division, 3. Dhaka North Division, 4. Chittagong North Division, 5. Chittagong South Division, 6. Rajshahi Division, 7. 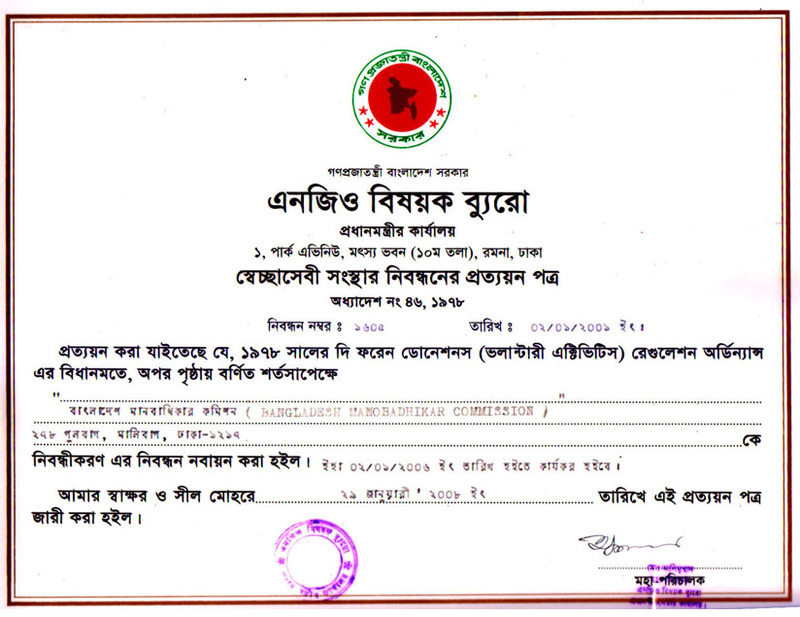 Khulna Division, 8. Sylhet Division, 9. Barisal Division and 10. Rangpur Division respectively. President and General Secretary of each district, City Corporation branch and 7 VIP Persons under the division shall be the members of this coordination committee. President and General Secretary of the Supreme Court branch shall be the member of the Dhaka Metropolitan divisional coordination committee. Members of the divisional coordination committee/National Executive Committee shall elect one coordinator, Divisional human rights convention shall be held at least for once in a year which shall be convened by the divisional coordination committee. Division coordinator shall have its office in the relevant district. National Executive Committee shall consider with importance the report sent by the divisional coordination committee on the activities of any kind of human rights or on any one of its branches and district committee shall follow the same. Divisitional Coordinatination committee tenure will be for the period of two years. District Branch: There are 64 districts in the country. There shall be one district committee or district branch of BHRC in each district. District Committee shall be constituted by the educationists, lawyers, journalists, physicians and eminent social workers working in the district. Organogram of the district committee shall be as follows: President 1. Vice-President maximum 11, General Secretary-1, Joint General Secretary 9, Finance Secretary-1, Joint- Finance Secretary-2, Organizing Secretary-3, Publicity & Publication Secretary-1, Law Affairs Secretary 2, Women Affairs Secretary-1, Social Welfare Secretary 2, International Secretary 1, Office Secretary 3, Cultural Secretary 2, Executive Member 101 persons in the maximum. At least 3 women and one or more than one representative from the minority groups shall be included in the Executive Committee. Government Service holders may become the members of the BHRC. However, they shall not be entitled to hold the post of President and General Secretary. In the tribal areas, one or more than one tribal members shall be included in the Executive Committee. Number of members of executive committee of all branches of BHRC Executive Committee consists of maximum 141 members and minimum 7 members. More than such numbers will also be admissible. The post of Executive President will use as special required by approval of a National Headquarter or Secretary General of BHRC. District branch shall operate the activities for the settlement through the arbitration proceedings, legal aids, urgent action, publication of notices in the newspapers, calling of press conferences, running of investigations proceedings, organization of seminars and workshops. Watching of local and national elections, running of relief activities for helping the distressed people during the periods of disasters, 10th January BHRC Anniversary Celebration and observation of 10th December as world human rights day as world human rights day in a befitting manner. District branch shall observe 10th December as world human rights day under its own initiative through different programmes including organizations of rallies, blood donation camps, competition of painting pictures on human rights, discussion meetings, seminars and different publications and they shall encourage other branches under the district for observing the day. District committee tenure will be for the period of three years. City Corporation Branch: There shall be four metropolitan branches or committees of BHRC in the four metropolitan cities i.e. Dhaka, Chittagong, Rajshahi Khulna, Sylhet, Barisal, Comilla, Narayangonj and Rangpur following the same procedure of organogram like the district branch. Metropolitan branches shall be constituted all the activities of them including their tenures shall be operated following the manners of the district branch. 7 City Corporation committee shall enjoy the status like that of each district branch and shall have the similar power within its own geographical area. Members residing within the City Corporation area shall be treated as the members of the City Corporation branch. City Corporation committee tenure will be for the period of three years. Supreme Court Branch: There shall be branch committee of the BHRC the in highest court of justice in Bangladesh, Bangladesh Supreme Court. Supreme Court branch committee shall enjoy the status of the district committee and shall be operated directly by the head of the commission. Lawyers and other workers associated with the supreme court and high court may become members of this branch. This branch shall investigate the suits related to different human rights in the national level and conduct law suits in the high court and supreme court. Supreme Court committee tenure will be for the period of three years. Regional Branch: BHRC can be established as Regional Branches in the specific region for faciliting to manage its activities. Regional Branches of BHRC will operate its activities like District Branches, Metropolitan Branches and established Branches according to the rules of BHRC. National Headquarter will decide of the activities of regional branches. Regional branches will operate of activities its all centrally such as district and metropolitan branches. Regional branches will not keep any branches under of its activities. Regional Branch can be collected the members from all the places of the region and one executive committee of regional branch will operate the activities of regional branch. Regional committee tenure will be for the period of three years. Upazilla/Thana Branch: There shall be one branch of the Human Rights Commission in each Upazilla/Thana of the Country. Upazilla/Thana Committees shall be constituted and operated following the organizational proforma followed by the district committee. President and General Secretary of the Upazilla/Thana Committee shall be the ex-officio members of the district committee. District Committee shall monitor the activities of the Upazilla/Thana committee and if necessary. They shall control the affiliated branches of the municipality and educational institution under the Upazilla/Thana. Thanas affiliated under the metropolitan areas Upazilla/Thana shall be operated under the metropolitan branch. Members residing in the areas under Upazilla/Thana shall be competent for including themselves as members of the Upazilla/Thana branch. Upazilla/Thana committee tenure will be for the period of three years. Municipalility Branch: There shall be a municipality branch or committee of the BHRC in each Municipal area of Bangladesh. municipality branches shall be constituted following the organizational proforma of the district committee and shall be operated following the similar rules. Persons residing in the municipality areas shall be competent for including themselves in the municipality branch. Upazilla/Thana branch shall supervise the activities of the Upazilla/ municipality branch. In the greater municipalities were more than one. Thanas are included with in them, in those cases, district committee shall supervise the activities directly. Following the similar methods, municipality branch may constitute municipality ward branches and shall enjoy the status of the branch of a union. Municipality committee tenure will be for the period of three years. University Branch: There shall be one branch of the BHRC in each University of the country. Teachers, students and employees of the university may become the members of the committee. University branches shall be constituted and operated following the proforma of the district committee. University committee shall be constituted and operated by the relevant district committee. University committee tenure will be for the period of two years. City Ward Committee: There shall be one ward committee of BHRC in each ward under for City corporation or metropolitan city in Bangladesh, i.e. Dhaka, Chittagong, Khulna, Rajshahi, Barisa, Sylhet, Rangpur, Narayangonj and Comilla respectively. City ward committees shall be constituted following the constitutional proforma of the district committee and they shall supervise the activities of the branch ward committees of the Metropolitan/City Corporation. City wards shall enjoy the status of the union branches. Persons residing under the areas of the ward shall be competent for becoming members of the ward committee. City Ward committee tenure will be for the period of two years. Union Branch: There shall be a branch committee of BHRC in each union of the country. Union branches shall be constituted and operated following the organizational proforma of the district committee. Upazilla/Thana branches shall constitute and supervise the union branches. Persons residing in the union shall be competent to be included in the union branch. Union committee tenure will be for the period of two years. College Branch: A college branch committee of the BHRC may be constituted each college of Bangladesh. Teachers and students of the college shall be the members of this branch. Each college branch shall be constituted and operated following the proforma of the district committee. Upazilla/Thana committees shall be constituted and their activities shall be supervised by the Upazilla/Thana committee on behalf of the district and they shall enjoy the status of an union branch. College committee tenure will be for the period of two years. Industrial Organization Branch: In each industrial area one regional and industrial organizational unit branch committee of BHRC may be constituted. Industrial organizational branches shall be constituted and operated following the proforma of the district branch. District branches shall directly constitute and supervise the activities of the industrial organizational branch and industrial regional branch workers and employees working in the local industrial organizations may include themselves in these committees and shall enjoy the status of union branch. Industrial committee tenure will be for the period of two years. Membership: 17. Membership: Men and women who are aged 18 years may get the membership of a branch after filling in the membership form prescribed by the commission if such member declares his allegiance to the constitution/national guide line of BHRC. For the membership and admission fee monthly fee Bangladeshi 100 BDT, Overseas US $ 15 or ₤ 20 GBP or € 12. Relevant branches shall receive the money of admission fees of the members and monthly subscriptions. The National Hed Quarter of BHRC can grant life member of Social workers, renowned persons and the distinguish persons of the country. Life members will get a certificate and an Identity card. Every two years identity card should be re-newed. If necessary, head office of the commission shall preserve the right suspend or to cancel the affiliation or permission given by them. Election and Tenure: For the constitution of the National Executive Committee of BHRC national of standing committee shall elect/nominate 6 members from among its members. General divisional coordination committees shall unanimously elect/nominate 4 persons from among its members taking 1 members from the respective divisions. Subsequently, General Secretary shall nominate 1 person more and complete the National Executive Committee comprising of 11 members. If necessary, head office of the commission and branches may constitute in election commission comprising of two members for holding elections. Out of them one person shall be treated as chief election commission and another person shall be treated as the election commissioner. Chief election commissioner shall complete election within 30 days. Tenure of the National Executive Committee shall be 5 years. Tenure of all the advisory committees shall be between one to two years. Tenure of all the branch committees shall be three years during the period of their establishments and subsequently they shall be elected or nominated directly after every two years. International Conference: Under the auspices of the National Executive Committee of BHRC. A International Conference shall be held after every two years. Presidents and Secretary General of National Standing Council, National Advisory Council, Divisional Coordination Committee, International Branches Committee, District, City Corporation, Supreme Court, Upazilla/Thana and Municipality branches shall be included as representatives in the International Conference. National Executive Committee shall remain bound for abiding by any decision taken unanimously by the International Conference. National/Regional Conference: For accelerating the activities of BHRC special importance has been put on holding of the National/Regional conference. BHRC Standing Council and National Executive Committee will organize national conference each every 2 years. BHRC divisional conference shall be held in each division in each year under the auspices of the divisional coordination committee and in the same manner. All the branches shall organize conference of the branches at least once in a year in these conference, effective measures shall have to be taken so that the members of the Advisory committee. Executive committee and General members of the relevant committee and general members of the relevant branches compulsorily attends in those conferences. Governor General, Governor, Deputy Governor and Additional Deputy Governor. National Standing Council: National Standing Council of BHRC shall be regarded as the highest council of the commission. This council shall reserve the right of dismissing the committee of any branch committee including the National Advisory Council and National Executive committee before completion of their tenure, at any time. 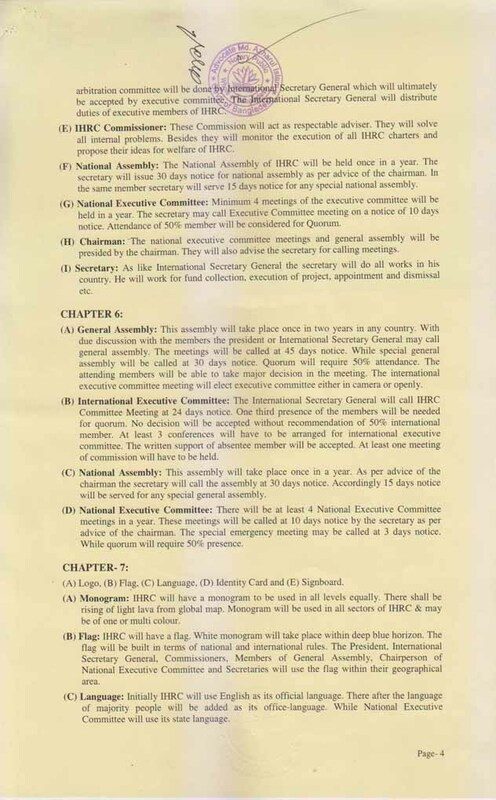 Standing council may constitute a convenor committee for 3 month after desolving the National Executive Committee. National Executive Committee: National Executive Committee shall carry out all the activities of the head office of BHRC and it shall act for supervising and monitoring the activities of all the branch committees. If any branch or member of a branch does any act against the interest of the commission, National Executive Committee may carry out investigation on that matter by its own initiative and it shall have the power for revoking or canceling the relevant branch committee or membership of the relevant member after carrying out investigation through any branch. National Executive Committee shall reserve the right for giving approval to any branch after constitution of it by its own initiative and it may cancel or revoke the permission of the same. Besides, it may carry out activities for receiving money for the commission from the donor agencies. If commission is confronted with any complex problem, National Executive Committee shall solve it through the members of the National Advisory Council. President: President of the National Executive Committee shall be regarded as the chief of BHRC. He shall preside over the meetings of the National Executive Committee and he shall supervise the activities of the Secretary General for the implementation of the decision taken by the National Executive Committee. President shall request the Secretary General for calling the meeting of the National Executive committee. If the president goes outside the country. A senior member of the National Executive Committee shall perform duties in lieu of him. Secretary General: Secretary General of the National Executive Committee of BHRC shall be regarded as the chief executive of the BHRC. Secretary General shall be responsible to the National Standing Council, International/National General Conference and National Executive Committee, On behalf of the National Executive Committee. Secretary General shall reserve the right to constitute branch through the District branch or directly or the right of approval, special promotion, withdrawal, dismissal of the committee for the greater interest of BHRC. Adjournment of the activities temporarily of a branch. Suspension of permission or revocation of permission given to a branch. For the collection of funds he may initiate any programme for the preservation of the interest of the commission including making communication with the donor agencies. Secretary General may take any effective legal action including constitution of investigation committee and publication of reports on any national or international matter. Secretary General shall reserve the rights of appointment, suspension or dismissal of the salaried officers or employees of the head office and any level of branches of the commission. For accelerating the activities of the commission, Secretary General may appoint/nominated 20 Regional Coordinator (Greater Districts) and 20 Special Representatives for a tenure of 2 years in the maximum from all over the countries and overseas with the status similar to the status of the President/General Secretary of the District Branch. If any activity of any member of the National Executive Committee has been proved to be against the interest of the BHRC then in that case, Secretary General may suspend his membership temporarily. Besides, he may appoint/nominate a responsible human rights worker temporarily as the Divisional coordinator for a tenure of 2 year. When the Secretary General shall stay outside the country. He may transfer his responsibility to any member of the National Executive Committee Secretary General may give permission of carrying out his activities through the Executive Director/Director of the Commission. 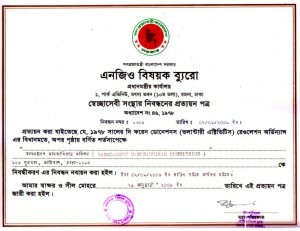 Power of the Branch Committee: For the appointment and dismissal of the members of the branches in the districts, City Corporation areas, Supreme Court, Upazilla/Thana, municipality, university, college, union, Industrial Organization and city ward branches any decision taken with the consent of two third majority of the members of the relevant branches shall be treated as final. If recommendation for approval is sent to the National Heqadquarter after constitution of the Upazill/Thana, University, Municipal branch within the District or recommendation for the revocation of such branches is sent to the head with the joint signatures of the President and General Secretary of the District head office shall implement it. District branch may give approval revoke or cancel other branches such as, union, college, Industrial regional and Industrial Organizational Branches with their unanimous decisions. Those persons shall become the President and the General Secretary of the Branch Committee who shall be able to operate the activities of BHRC by hanging its sign boards in front of their own chambers or residences. 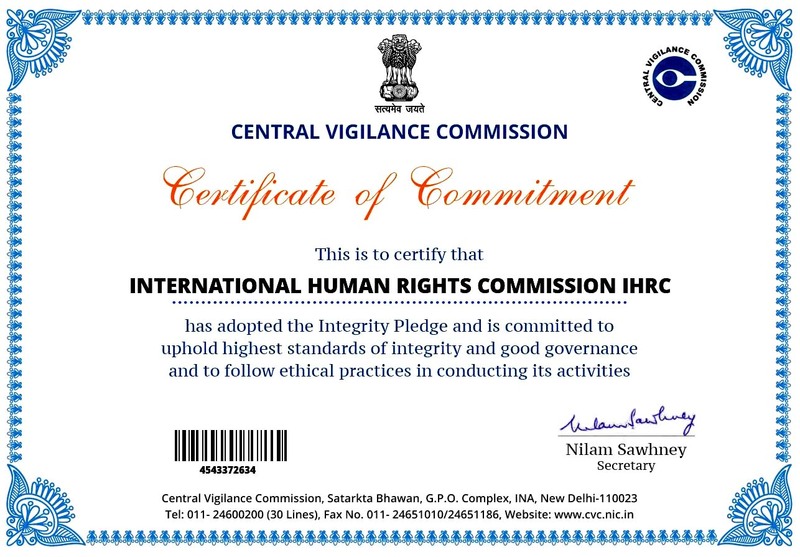 Branches shall be competent for operating any activities of the presentation of any kind of violation of human rights by their own initiatives. President of the Branch: Presidents of all the branches of BHRC shall be considered as the Chief of their respective branches and they shall president over in all the meetings of the executive committees of the branches. Where there is no activities of BHRC for accelerating its programmes for the implementation of the decisions taken by the branch executive committee, for increasing the members of the numbers of the members or where there is no programmes of it within the area under any branch. Introduction of programmes in those areas and responsibility of supervision to see whether the General Secretary is properly performing the duties of implementation of the decisions taken by the executive committee has been entrusted upon the President of the Branch. During the periods of absence of the President. Vice-President of the branches shall perform the duties of the President. General Secretary of the Branch: General Secretaries of all the branches of BHRC shall be treated as the chief executive of the branches. General Secretary shall implement the decisions of the executive committees of the branches. General Secretary shall reserve the right to accept, reject or carrying out of investigation if necessary General Secretary shall consider with importance any consultation given by the President regarding any programme of the branch General Secretary shall remain responsible directly to the executive committee of the branches. After constituting the district branch. Metropolitan branch, international branch and Supreme Court Branches. General Secretaries of the branches shall send them to the head office with their recommendation for their approval. General Secretary shall reserve the rights far constituting and dismissing the committees of other branches with his own initiative. During the periods of absence of the General Secretary any one among the Joint Secretaries shall perform the duties of the General Secretary. General Secretary shall reserve the rights of appointment of the officers in the branch, distribution of their duties and supervision of their activities and appointment and dismissal of the employees. b) The member of the National Advisory Body; Presidents of National Executive Committee; Treasurer of National Executive Body and Divisional Co-ordinators may use their respective terms, or, if desired, may use the term “Governor” for their posts. c) Special representatives of different divisions and Regional Co-ordinators may keep their respective former terms for their positions or may use the term “Deputy Governor” for their posts. d) Either the District Presidents or City Presidents or the District General Secretaries (one person from each committee) may use the term “Additional Deputy Governor”. But prior permission from the Head Quarter is mandatory. Maintenance of Expenditures: At least one savings/current account shall be maintained in the commercial banks by the head office and each of the branch committee of the BHRC Account of the head office shall be operated by the joint signatures of the President, Secretary General and Treasurer of the National Executive Committee. Secretary General Signature is mandatory while any one from others two can operate the bank account. In the cases of the branches, accounts shall have to be opened by the joint signature of the President. General Secretary and the treasurer and accounts shall be operated by the signatures of any two of the above mentioned three persons. Collection of Funds: Head Office of BHRC may collect funds from any international donor agency following the rules of the Government. Besides, head office of the commission shall receive registration fees from each district Metropolitan and Supreme Court branch, registration fees from each Upazilla/Thana and municipal branch, registration fees from all other branches. Except those, funds shall be created by the head office and the branches by receiving a part of the money received by selling the magazines on human rights, by receiving registration fees from the solvent applicants who wants to get help, by receiving members and life member admission fees and the monthly subscription of the members. International branches registration fees Head Office and branches of the commission may create funds by collecting money form the local donors. Except that, district, metropolitan supreme court and international branches may receive funds following the rules against the projects subjects to the approval of the Secretary General Head Office and branches of the commission may create funds by receiving Government and non-Government institutional donations and personal donations locally. Audit: It shall be compulsory for the head office and all the branches of BHRC to maintain proper accounts of the money spent by them against their activities. Accounts of incomes and expenditures of the head office and their branches shall have to be audited after every two years by a registered audit firm. National Executive Committee shall submit the audit report to the national general conference and the treasures of the branches shall submit the yearly financial report to the annual branch meeting. Publicity, 2. Use of Signboards, 3. Participation in the State programmes, 4. Flag, 5. Identity Card. Publicity: For the acceleration of the activities and extension of the programmes of BHRC proper publicity of them is imperative. Through the publicity, activities of the Human Rights workers shall become speedy. Side by side with the publicity of the activities of the activities, the head office of the commission, branches of it may do their own publicity works by publishing their investigation reports, monthly reports of the branches, sending of press releases to the local and national media after carrying out investigations on the special occurrences held within the areas of the branches and by making arrangements for press conference. For the purpose of publicity of the programmes of the commission, side by side with the head office, branches may increase their publicity by the publication of journals, posters, calendars and by awarding medals to the notable persons for their role in the human rights oriented activities. Use of Signboards: Head Office of BHRC together with each one of its branches shall compulsory hang signboards in front of their offices. Except that, head office and branches of the commission may hang more than one signboards containing arrow marks in the main roads hang signboards besides, they may hang signboards containing the scriptures on human rights in the airports, railway stations, bus terminal, launch ghats, court areas and other public places. Signboards of BHRC shall be written in white words on a blue black ground. Besides, there shall be the white monogram of BHRC in each sign board. Measurement of the signboards shall be two feet x one and a half feet in the minimum. 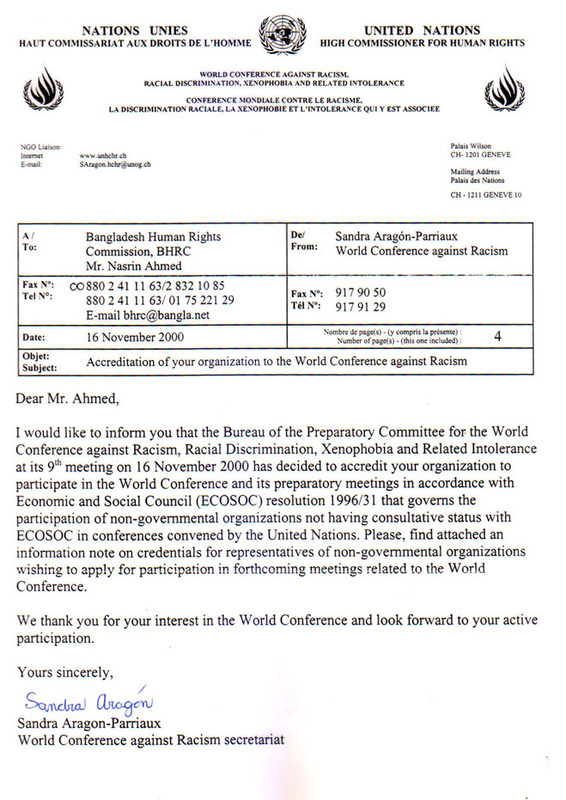 Participation in the State Activities: BHRC has been working as an auxiliary force in the field of the development of the country and the development of human rights by the state BHRC took the initiative for the first time in 1995 A D for constituting a human rights organization in the state level which is now under the process of implementation. Besides, it has continued its cooperation to the state activities by taking membership in different committees in each district and Upazilla/Thana level as a non-Government Human Rights Organizations by this time. Till now, representatives of BHRC have played and are playing important roles in many districts as the members of the law and order committee. Committee for the prevention of oppression to the women and children, committee for the development of environment and district legal aid committee. Except those, representatives of BHRC are performing specially important roles in a good number of districts for the preservation of human rights in the district jails and by working as Jail Inspectors Similarly. Representatives of the commission are extending their co-operations to the state activities by including themselves in the law and order committees in the Thana and Municipal level. Flag: BHRC shall have a flag National office or Headquarter of the commission together with all its branches may use or hoist this flag in front of their offices. President of the National Executive Committee, Secretary General and National Advisors of the Commission may use this flag in their respective vehicles while performing the duties of the commission within the country. Presidents and General Secretaries, Special Representative and Divisional Coordinators of all other branches may use this flag in their vehicles during their movements within their respective areas. Size and measurements of the flag shall have to be made following those of the flag of Bangladesh. There shall be a while colored monogram of BHRC in the middle of the Blue colored cloth. Identity Card: All the members of the National Executive Committee and all the members of the Branches of BHRC will have identity cards. Identity cards of all the officers/employees of the National Headquarter, all the members of District, City Corporation, Upazila, Regional, Industrial Region, Municipality, University, Union and Ward Committees will be signed by the Secretary General. Identity card of the Secretary General will be signed by the President of the National Executive Committee or the Chairman of the National Advisory Council. National Executive Committee or the Chairman of the National Advisory Council. Life Member ID Card will be signed by the Secretary General of the National Executive committee. Visiting Card : All the members of the National Executive Committee, members of the National Advisory Council. 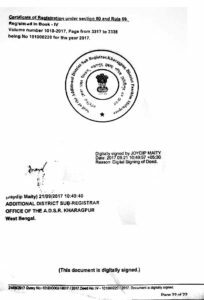 Offices of all branch committees and salaried officers may of the commission use visiting cards containing the monograms of BHRC after printing them.